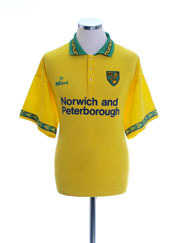 The Norwich City shirt sponsor from 1983 to 1984 was Poll Withey Windows. Players/match issue. Very rare red GK jersey. First sponsored shirt. POLL WITHEY WINDOWS.